For Immediate Release — Monday, April 23rd, 2018 — NuCypher, a Y Combinator and Polychain Capital backed data security company based in San Francisco, announced that it has joined the Enterprise Ethereum Alliance (EEA), the world’s largest open source blockchain initiative. 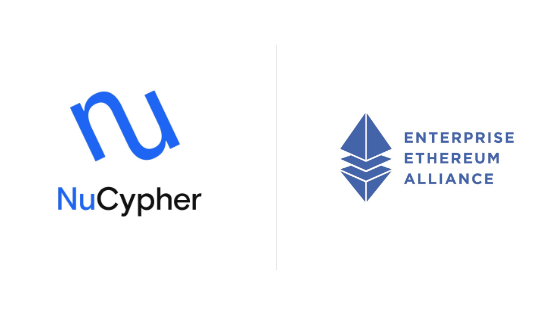 As a member of the EEA, NuCypher will collaborate with industry leaders in pursuit of Ethereum-based enterprise technology best practices, open standards, and open-source reference architectures. NuCypher’s Decentralized Key Management Service provides state-of-the-art encryption and access control functionality for distributed applications (dApps) built on the Ethereum blockchain. It provides a large suite of security features enabling developers to customize the level of protection to match the security and privacy needs of their applications. NuCypher is a data privacy layer for blockchain and decentralized applications that enables developers to store, share, and manage private data on public blockchains. Its decentralized key management systems uses proxy re-encryption to enforce cryptographic access controls for decentralized applications. Proxy re-encryption is a more scalable form of public key encryption (PKE) that scales to provide a one-to-many data sharing pattern. NuCypher’s security layer allows stored data records to remain private, confidential, and encrypted while maintaining the ability to share these data records with trusted parties. Whether sharing data with departments, partners, vendors, customers, or regulators, NuCypher gives the data owner full control. For more information please reach out to ryan@nucypher.com or visit www.nucypher.com.